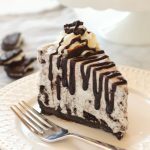 This Easy No Bake Oreo Cheesecake is smooth and creamy - it's the perfect cheesecake recipe and it's SO easy to make! Combine the Oreo baking crumbs and the melted butter and press the mixture into the base of a spring form pan. Whip the cream cheese on high speed until smooth and creamy. Add the powdered sugar and continue to whip on high speed until well combined. Fold the whipped cream and the coarsely crushed Oreo cookies into the cream cheese mixture with a rubber spatula just until well combined. Pour the cream cheese mixture into the prepared pan and smooth out the top. Chill the cheesecake in the freezer for at least 2 hours (4 hours or more is ideal), and remove to room temperature for 20-30 minutes before garnishing with additional whipped cream, chocolate sauce, and crushed Oreo cookies and serving.